There are a lot of fresh faces in the Padres’ locker room this season. Besides the multiple prospects who are making their way through the system, there are a few veteran players who are starting the 2018 season off fresh. Buddy Baumann is one of those men, as the left-handed pitcher struggled in 2017 with his health. A nagging back injury sidelined him for most of the first half of the season. He pitched well in the minors once he was ready to go, posting a 2.77 ERA in 11 games and 13 innings pitched for the Friars. 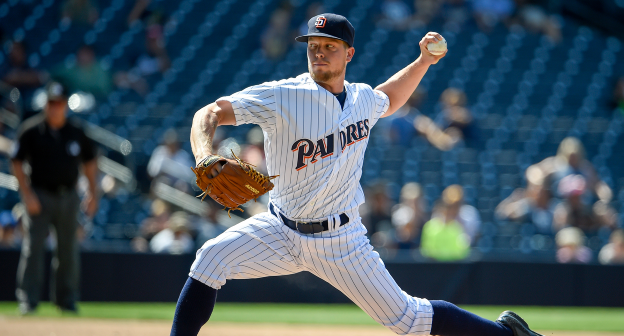 The lefty was promoted to the Padres in August and performed well for San Diego, recording a 2-1 record with a 2.55 ERA, as well as a 1.019 WHIP in 23 games and 17.2 innings pitched. I was eager to talk to Buddy, as I have always liked the stuff he has. I was concerned about his back and whether or not he felt 100 percent. “This season has been fresh.” He was referring to the fresh start he will get in 2018 with a clean bill of health. I’m excited for the lefty. He is indeed healthy. Our conversation turned towards mechanics and if the Padres were having him work on anything in particular. “No (nothing new), just working on being aggressive. 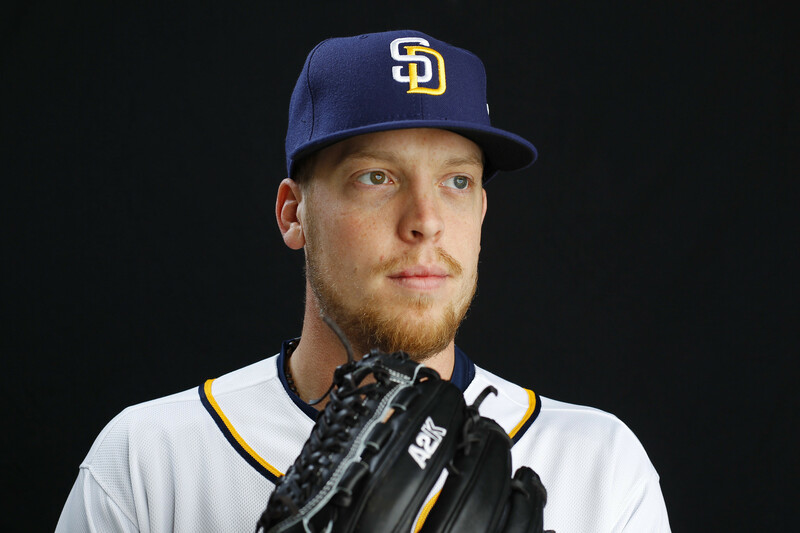 Especially early in the count.” Andy Green has emphasized to certain pitchers that they must attack hitters. Baumann has the stuff to be successful if he works ahead in the count. We next discussed his repertoire. “I’m a fastball-heavy pitcher.” I wanted to know if Baumann was mixing in anything at this point in the spring. “Just trying to mix in the cutter now and then”, was his response to me. He is working on things, but was hesitant to give up too much information. The Padres’ locker room is full of youth right now. I asked Buddy if he noticed the difference from last season. “It is such a big change. A lot more energy. When you have young guys, everyone is excited about the next step. It has been a lot of fun to be around.” Fun is certainly a common theme in Peoria, as these Padres enjoy coming out to the ballpark each and every day. Sometimes it is difficult to mix veterans and young players in a clubhouse. I asked Buddy if the vets were taking care of business with the young pups in the system. “The veterans are allowing the growth to happen with these players. They are not trying to control it.” Excellent answer from the hurler, as the veterans are just sitting back like most of us and enjoying the show. Sure, they intervene when needed, but the majority of the growth is just allowed to happen for these prospects. These young players need to find out for themselves about the game and what it takes to succeed. There is certainly a healthy competition in Padres’ camp this season. There are several battles taking place, and that is just how Andy Green wants it. He wants all these young man to battle it out for playing time and earn their spot on the team. Buddy and I spoke about competition, and this is what he told me. “That has been the story of my life. That’s the way I want it. That’s how I am going to be the best. If I know someone is out there competing for my job, it’s going to make me better. That is just the name of the game. It is nothing new. Competition makes the whole team better.” Yes, it surely does make the whole team better, as nothing is handed to you. As a player, you must earn everything you get. Earlier in the day, I asked Andy Green about the possibilities of keeping multiple left-handers in the bullpen for 2018. “I’d like a couple, in an ideal sense. Brad Hand plus one. But that doesn’t mean only two. I can see a scenario where four guys are in our bullpen. I would like to see at least another one out there as we use Brad (Hand) in high-leverage situations (this season).” This bodes well for Baumann. If he continues to pitch as he has this spring, he should make this team. It will be close though, as that competition that Buddy craves so much is very intense this March. And he surely wouldn’t have it any other way. Next Is the Sun Setting on Alex Dickerson’s Tenure with the Padres?